Prefab housing has been around since the 1940s. The entire point of prefab was not to have to worry about the construction--all that happened somewhere off-site. It was anonymous and standardized, and led to perfectly serviceable homes that lacked even a breath of personality. After decades in which prefab was relegated to postmodernist architects, the modern DIY movement got to it, resulting in WikiHouse: a mix of Wiki software, computer-aided design programming, and CNC machining techniques that puts building design straight into the hands of the end users. 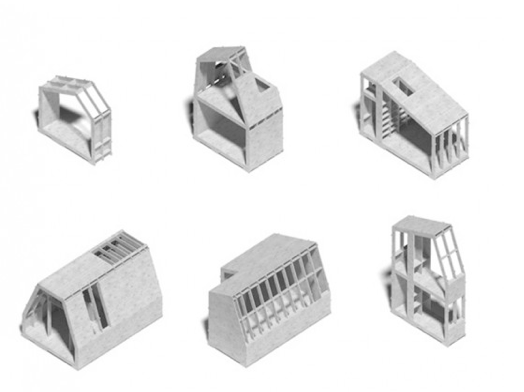 00:/, a London architectural practice, released WikiHouse as a plugin for Google Sketchup as part of their contribution to a discussion on open-source design. A video of their prototype is up on the website—a large shed-like structure, designed and built in about 24 hours. The official debut, and construction of the first complete WikiHouse, is scheduled for the Gwangu Design Biennale in South Korea during September and October this year. Once you have all the necessary components—Sketchup, WikiHouse, and a CNC mill, as well as a bunch of 18mm plywood—the WikiHouse process is surprisingly simple. You draw your house on Sketchup, borrowing components from other users as you like, and then feed it to the WikiHouse plugin, which works its magic and spits out a set of milling drawings for the house. Those milling drawings, when given to a CNC mill, will cut standard 8’x4’, 18mm plywood into the frame and supports of your house. The frame and supports have interlocking slots included (no power tools necessary! ), plus labels, so as long as you can read, you can build your house. Then there’s insulating, wiring, plumbing…but there are manuals for that, right? The grand citadel of my dreams is only a few clicks away! WikiHouse will be released with a Creative Commons license, so the fun’s definitely not over yet. Are you interested? What would you build with it? Tell us in the comments!